Iam embarking on a new culinary mission… Saving the world from the evils of the fast food industry? No, but I wish I could… It’s a far more personal mission. I’m attempting to wean the king of carbs – my husband – off his steady and unyielding diet of white bread, pasta, chips, bagels and the like. After receiving the stats of his most recent health check-up, I’ve decided that intervention is truly the best medicine, one recipe at a time. What do you cook for a carboholic? How do you entice them will healthy, whole-grain or even low-carb alternatives that will resemble some of their best-loved dishes? French fries came to mind as I spied a basket of sweet potatoes on my kitchen counter, an hour before dinner time. I did a little research on sweet potatoes and per serving, they have 200 % of your daily intake of vitamin A, 100 % of vitamin E, 25 % of your intake for vitamin C. They are also a good source of manganese, copper, dietary fiber, vitamin B6, potassium and iron. As an antioxidant food, they help to repair cell damage in our bodies caused by a host of factors including pollution, radiation, cigarette smoke and herbicides, as well as free radicals naturally occurring within the body during the metabolic processes. Despite its sweet flavor, each serving (about 1 1/2 cups) only has 3 grams of sugar and is practically fat free! How does Miss Sweet Potato stack up to her white brother? While white potatoes have more vitamin C, they also have about five times the carb count and no vitamin A or E.
As the dinner hour crept closer, I located a few sprigs of rosemary at the bottom of my veggie drawer. 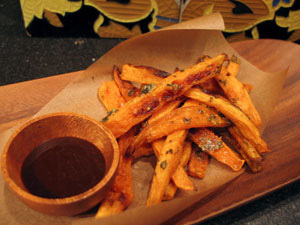 Sweet potato fries with rosemary and parmesan, low-fat BBQ sauce, and a buttery chunk of fresh halibut is on the menu for tonight. Learn more about the nutritional value of sweet potatoes.